When summer's blooms fade, bees, butterflies, hummingbirds, and other garden visitors look far and wide for sustenance. 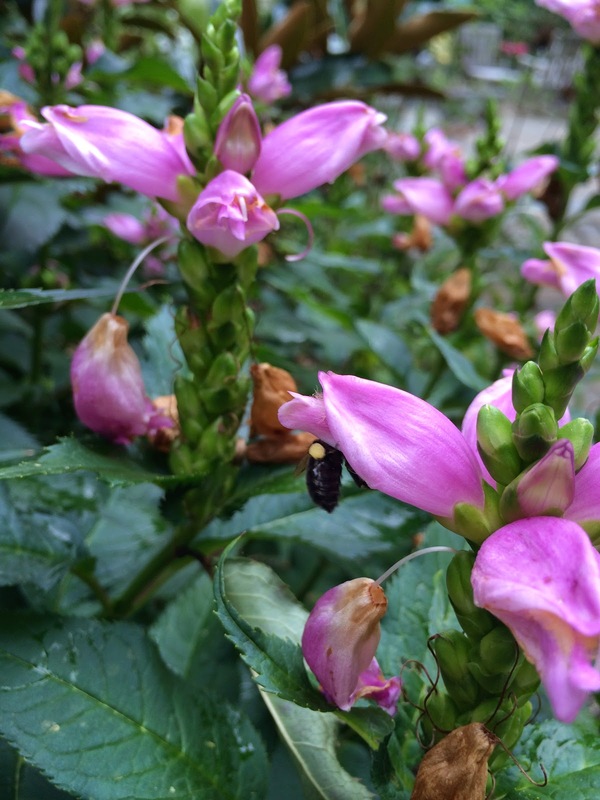 Fall is a crucial time for pollinators to fuel up on nectar and pollen. They need vital stores of carbohydrates (nectar) and protein (pollen) to nurture their young, hunker down for winter, or migrate to warmer climes. enters a Chelone lyonii bloom. Chelone lyonii 'Hot Lips,' commonly known as pink turtlehead, is perfectly timed to coincide with the demise of purple coneflower (Echinacea purpurea) and other summer stalwarts. This inviting perennial provides vital support to native pollinators, while brightening partially shaded garden corners in August and September. Its tubular, fuchsia blooms resemble turtles with their mouths wide open, waiting to gulp down insects. Fortunately, the plant is not carnivorous. 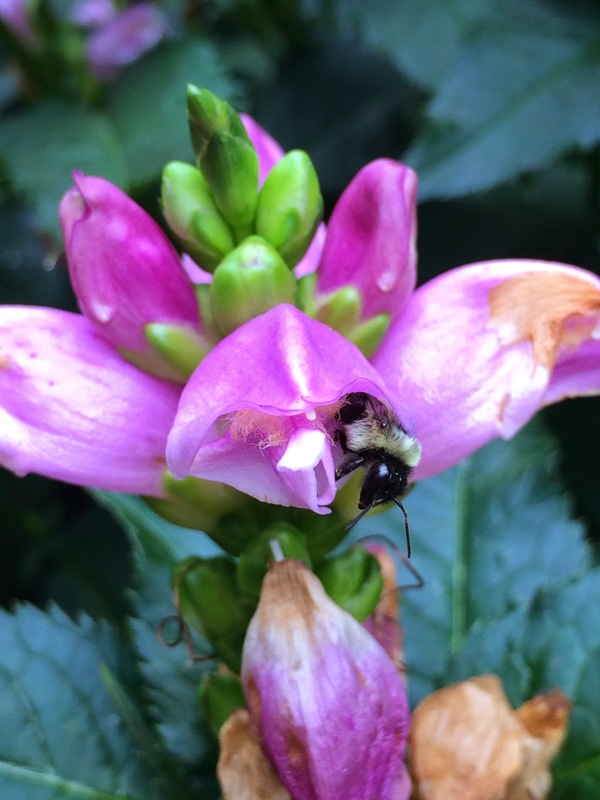 Blooms are built to host large bumblebees and then release them. ready to pollinate the next bloom. Once sated, the bee retreats, with plenty of pollen tucked away. They transport the pollen back to their hives in order to feed larva. Meanwhile, any excess pollen remaining on their furry legs and belly is deposited on the next flower they visit, ensuring the flower's reproductive cycle. Gardeners can support pollinators throughout the seasons by planting a range of native plants that bloom from early spring through frost. Chelone lyonii is native to the eastern U.S. and is hardy in USDA climate zones 3-8. Reaching a mature height of 2 to 3 feet, the bright green foliage provides a lovely backdrop for fading native blue-eyed grass (Sisyrinchium augustifolium), barrenwort (Epimedium), or Brunnera macrphylla 'Jack Frost.' In my garden, it spreads beneath a young magnolia tree, where it receives light afternoon sun. Though beautiful from a distance, an intimate look at Chelone lyonii reveals that there's more to her character than 'Hot Lips' implies. The symbiotic relationship with the larger eco-system makes her that much more desirable. If 'Hot Lips' doesn't fit into your color scheme, try white-petaled Chelone glabra, an equally beneficial species that is host to the Baltimore checkerspot butterfly. I've had the same experience with the Turtlehead! When I took pictures for Bloom Day yesterday, it was completely abuzz with bumblebees! And I love having a shade plant that blooms in the fall!